Pasta salads are one of my favorite lunches—and the best pasta salad recipes do double duty. Eat them warm for dinner, then have the leftovers cold the next day. Easy! Not only that, but pasta salads are the perfect way to empty out that crisper drawer and put any stray veggies and herbs you have on hand to good use. Pestos work particularly well if you want to make pasta that’s appetizing warm or cold. Traditional basil pesto is always a winner, but there’s a whole world of pesto options out there—for this recipe, I whipped up a lemony parsley pesto. When you’re using parsley as an ingredient and not a garnish, be sure to use flat-leaf or Italian parsley, not curly, because it has more flavor. I happened to have a bunch of it on hand from my CSA box. If you have a lot, this pesto recipe can be doubled or tripled and frozen for later. The rest of the ingredients are completely up to you. I used homemade sun-dried tomatoes and yellow squash because I also had that from my CSA box, but steamed broccoli, roasted red peppers, and zucchini would be perfect in this too; for protein, try adding chickpeas or white beans. You can serve this easy pasta salad warm for dinner and have the leftovers cold for lunch the next day. 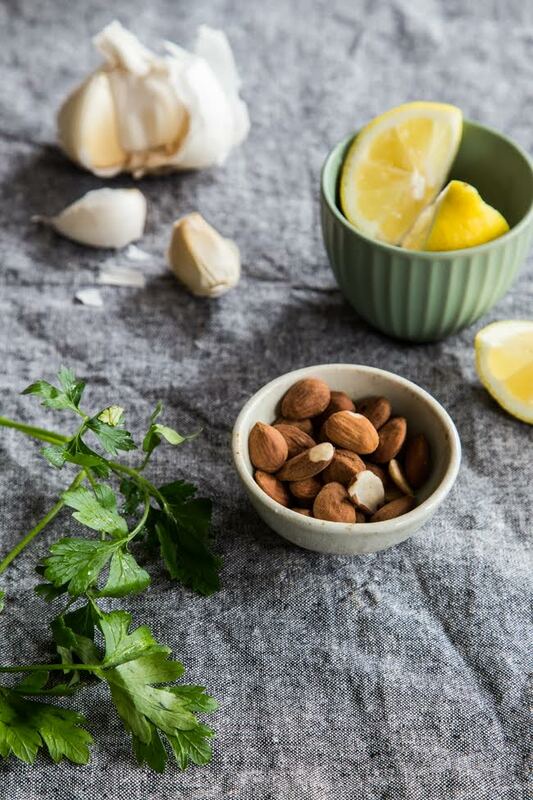 Combine the parsley, lemon juice and zest, garlic, almonds, and olive oil in a food processor. Process until everything is finely chopped, but not completely smooth. Add salt and pepper to taste. 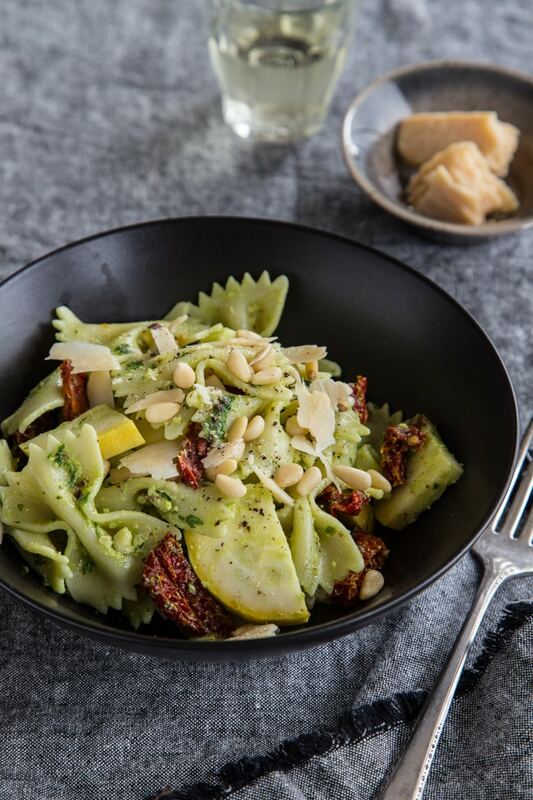 Toss together the farfalle, squash, tomatoes and pine nuts in a large bowl. Stir in the pesto, tossing to coat. Sprinkle with parmesan cheese, if using, and season to taste with salt and pepper. Refrigerate for up to 3 days.